How often have you heard God’s Word and said “No, I will not go” but later went? How many other times have you said, “Yes, I will go” but failed to do so? In each case we fall short of God’s glory and need a change of heart. Thankfully, through Christ we are afforded God’s mercy and grace. All we need to do is ask, and God will provide the will and means necessary to do that which he calls us to do. For the will of the Father is that we believe in his Son. 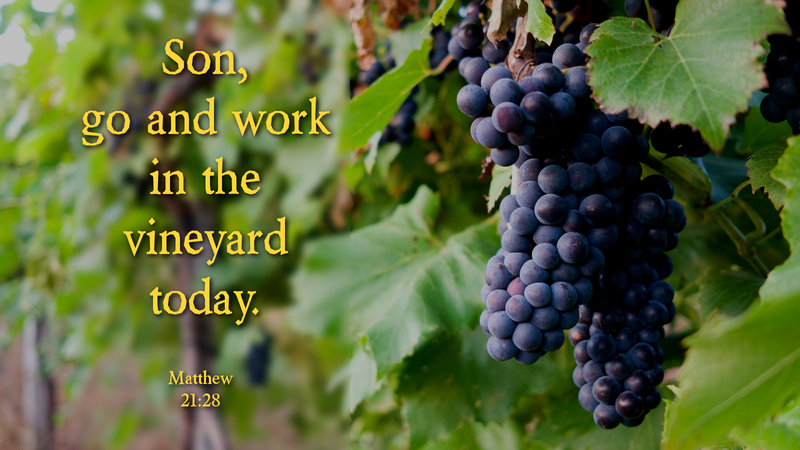 Today, as in all days, God calls you to work in his vineyard. How will you respond? This entry was posted in Discipleship and tagged Christianity, Disciple, Discipleship, Faith, Following Jesus, Jesus, Jesus Christ, Love your neighbor, Repentance, Spirituality, Teaching of Jesus, Word of God. Bookmark the permalink.